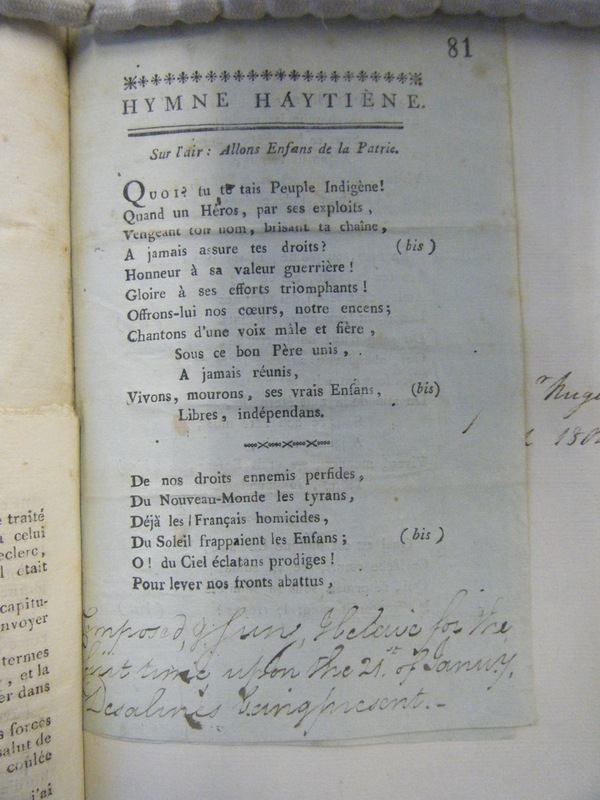 I found the “Hymne Haitiène” at the National Archives of the United Kingdom alongside the pamphlet version of the Declaration of Independence (CO 137/111). It was printed at the end of a printed version of Dessalines’s “Journal de Campagne.” The note at the bottom of the page (in Edward Corbet’s handwriting (the British Agent for Affairs in St. Domingo)) reports that it was composed and sung for Dessalines for the first time on 21 January 1804. The song was sung to the tune of the Marseillais. I am struck by the song’s emphasis on Jean-Jacques Dessalines’s role as unifier of the country; he is able to do this because he is the “father.” Only under his leadership, the song argues, would the country remain free and independent. This theme is repeated in Couplets, performed for Emperor Jacques 1er in November 1804. This song appeared in the Gazette Politique et Commerciale d’Haïti on 22 November 1804. The version I have is from a publication by the Bibliothèque National d’Haïti of the first two years of the newspaper.